Anmerkungen 1985 erschien bei Namco die Fortsetzung Dig Dug II. 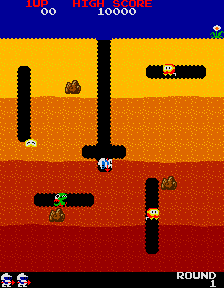 Dig Dug is an exciting new type of maze game. Now players create their own mazes by controlling "Dig Dug", a dauntless miner who feverishly digs tunnels to dodge or destroy the precocious "Pooka" or the ferocious "Fygar", and to collect veggie treasures. Changing screens, multiple difficulty levels, 21 unique sound effects and a calliope accompaniment enhance game play. 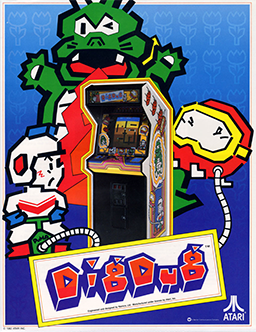 Dig Dug is a fun-filled new strategy challenge with fantastic appeal for every type of player – novice, expert, male and female.